I can't sew even if you put a gun to my head BUT that doesn't mean I can't recognize exquisite workmanship or material on a garment. I was rendered speechless the first time I clapped my eyes on a Chanel jacket. I'm no clotheshorse. I prefer a handbag over clothes most days. However, I have a weakness for jackets. Any well executed and beautifully tailored jacket will bring me to my knees. Chanel jackets transcend time. The timeless factor won me over. Who wouldn't like a classic jacket that will still be relevant in a decade's time? In fact, a tweed bouclé jacket that I fell in love at a Chanel exhibition was well over 45 years old.Wouldn't it be wonderful if I could pass my Chanel jackets to Lil L when she's old enough to appreciate them? More than a decade ago, I used to see Chanel jackets at my local consignment stores going for ridiculously low prices. They were always a couple of sizes too big. At the time, I didn't know that a Chanel jacket is made up of multiple panels which you could easily alter 2 to 3 sizes up or down. A word of advice here. If you don't have an excellent tailor who can tackle a job like this, go to a Chanel boutique. I had a tailor who bungled an alteration. Argh. 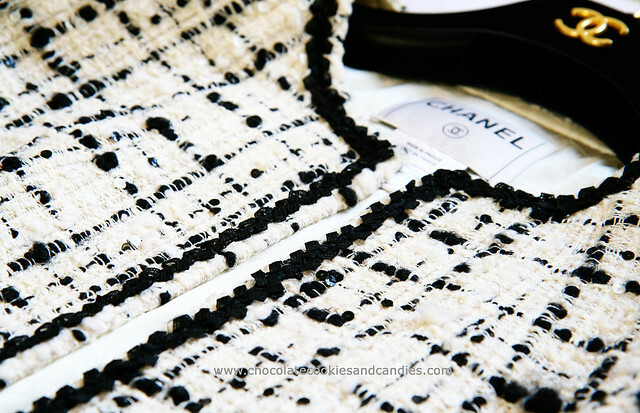 Did you realize that Coco Chanel used tweed in 1930s because it was cheap? That said, they're anything but cheap these days with a jacket running in the £2500 - £3500 mark on average. 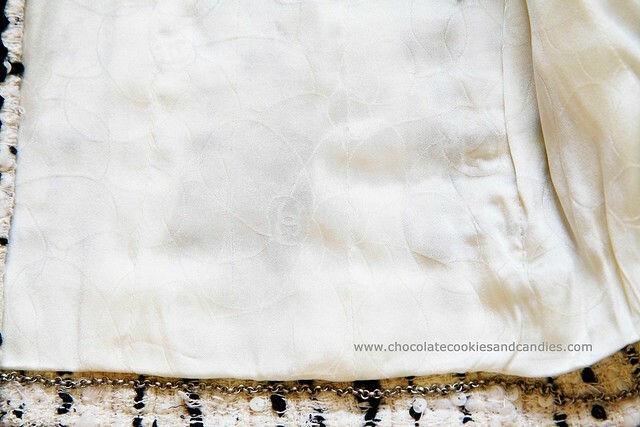 The brass chain that runs along the seam weighs the jacket down for a better drape and fit. 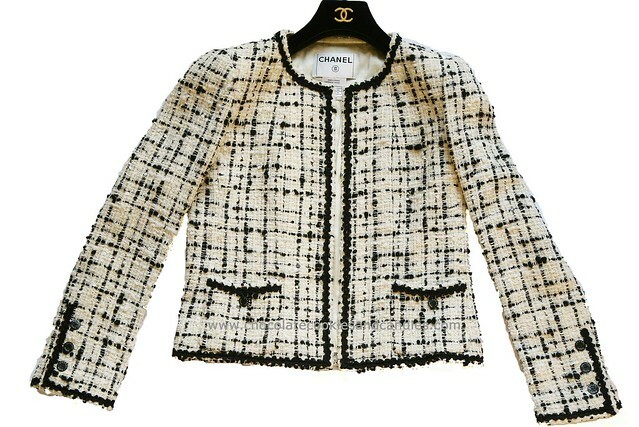 I have been obsessing over a contrasting ivory and black Chanel bouclé jacket for many years now. Imagine my delight (okay, that was an understatement. I was whooping for joy. How unladylike of me.) when I finally located one in near new condition in my size. It fits perfectly as if the jacket was made for me. I guess the saying patience is a virtue rings true here. Stunning! It doesn't get any nicer than that. I had no idea about the jackets having panels. Now that info will come in handy for a few ladies I would say. Where do you find these delights? I need to stop throwing my money down the drain by paying retail. Beautiful! Congrats on finding it, can imagine how you feel! What a gorgeous jacket! A timeless classic for sure! It is wonderful to own a piece of garment you can wear when you are 25 and again at 50 and Chanel jackets seem to do just that. This is just beautiful, M! What a find! I wonder if the panels have room to let out also? Though I have a couple of vintage Chanel jackets, I'm still searching for a perfect collarless boucle' tweed such as this. 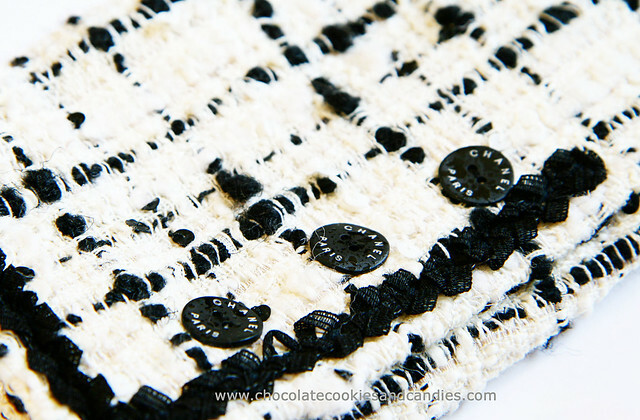 Promise me that, if I'm ever in your neck of the woods, you'll show me all these fab CS shops. And Fortnum & Mason! :) You've got me hooked. OMG - are you kidding me? This is BEYOND!!!!! I'm speechless! It only took me 5 years to find it! It really is exquisite. Not sure if you follow this blog. Interesting topics. I have not regretted any of my Chanel jacket purchases. Very snazzy jacket, I love the black and white. I LOVEEEEEEEEEE THIS! omg this chanel jacket is amazing.. this is one of the most gorgeous i've seen.. i'm def more of a handbag girl then a clotheshorse as well.. but i dream of owning a Chanel tweed one day!! wow... I am speechless, such a beautiful piece, wish I could find these things in Holland...you are the best treasure-hunter!!! This is absolutely stunning. What a gorgeous jacket. I 'm literally breathless. It was so worth the wait and I love, love love that your jacket is black and white.